This HORSE mask is designed for everyday fun, great for dress up and pretend play, ideal gift, perfect for themed birthday parties, party favor and photo props. Up for sale two-layers, handmade, high quality mask made of soft eco felt, recommended for children 3 years old and up. Insurance is available upon request at the BUYER'S expense. For more costume styles, please check my other listings! Quality product, fast shipping! A+! 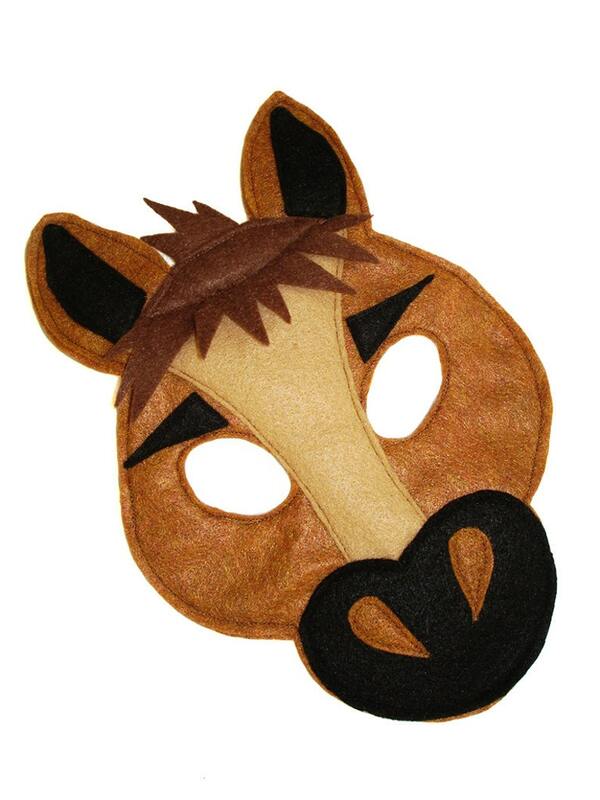 Perfect mask for my horse-loving 6 year old who wants to be a horse for Halloween. Very cute and well-made. The mask and superhero overlay mask are perfect! My 4year old is thrilled, and I’m very happy with the high quality construction. Excellent work! I accept Paypal (you do not need to have an account with them to use it), Etsy Gift Cards and Direct Checkout through Etsy. All Custom Order Sales are final and no refunds will be given. EXCHANGE is possible upon request for any standard size item purchased. The customer will be responsible for shipping and handling fee of $7.50. If you receive a damaged or defective item, contact us within 3 days of delivery at magic@magicalattic.com Please, include your item number from your original confirmation e-mail. I will make every reasonable effort to replace the item in a timely manner. I ship all my orders via USPS Priority Mail w/Delivery Confirmation (US only). I charge a low shipping fee for your entire order. My shipping charge for Priority Mail in US varies from $5 to $11. Priority Mail will take 2 to 3 business days to arrive. The above shipping time exclude weekends and holidays. Time for standard and custom orders: If you place an order for a standard size costume, I will send it out within 4 to 6 business days. If you place a custom order and submit the measurements, I will send out your package within 10 to 14 business days. During busy times, such as Halloween and Christmas any order may take longer to be ready to ship. Please, make sure to provide us with all information regarding the date your order is needed. Rush orders: If you are in a rush to receive your item please, let us know your deadline. We may be able to fulfill your request, however we can not guarantee it. Please, be advise that additional fees might be required including overnite shipping. I ship internationally upon request via USPS First Class International Mail and additional shipping fee is required for any of these orders. Parental supervision is strongly recommended for all children under 3 with capes that contain small parts because of choking hazards. Children's BLUE HORSE Farm Barnyard Animal Felt Mask, Brown Bear, Brown Bear, What Do You See? Children's PURPLE CAT Farm Animal Felt Mask, Brown Bear, Brown Bear, What Do You See? Children's WHITE DOG Animal Felt Mask, Brown Bear, Brown Bear, What Do You See?